Tear 2 large pieces of foil and fold them in half. Press one piece of foil into a large bowl. Fill this with the potatoes, spices, garlic, oil, preserved and fresh lemon and season. Toss the potatoes gently to cover in spices without tearing the foil. Place the second piece of foil over the top and roll top and bottom edges together to create a sealed pouch of potatoes. Place the pouch directly onto a hot grill, BBQ or pan and leave to cook for 10-15 minutes before flipping and cooking for 10-15 minutes on the other side. In the meantime combine all dressing ingredients well. For the fennel salad, remove the base and leaves of fennel bulb and shave fennel thinly. Toss fennel together with mint leaves. Check the potatoes are ready by creating a hole in the pouch using a skewer to release the steam. Carefully open it from one side. Potatoes should be caramelised and a skewer can be easily pushed into the flesh. 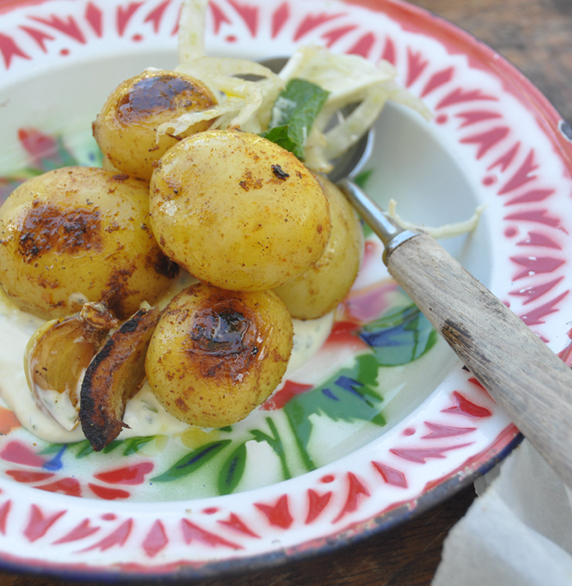 To serve, leave the potatoes in the foil or place in a bowl and top with dressing and fennel salad.